Pre-order the ebook now - paperback available on October 1st. This week, I'd like to introduce you to Kristie Kandoll. 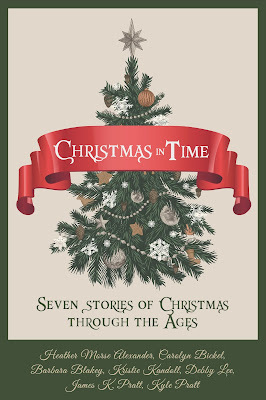 Kristie is another of the seven authors contributing to the anthology Christmas In Time. I had the privilege of critiquing the first few chapters of Kristie's story and I was drawn directly into the emotion of the conflict. I can't wait to find out how it ends! My love of northwestern North Dakota runs deep. My ancestors homesteaded the land that my brother still farms. I have the utmost respect and admiration for these tough pioneers. A harsh climate, rocky soil, and often little money, produced resilient, hard-working people. One of our bachelor relatives farmed near us when I was growing up. My parents included him in our holidays, and he enjoyed Mom’s home-cooked meals. He held a special place in my heart, and I worried about him going back to his empty house. I’ve wondered how his life—and all our of lives—might have turned out differently if at some point he or we had chosen a different fork in the road. Kristie Kandoll lives in the Pacific Northwest with her husband. She grew up in North Dakota and enjoys writing Christian historical fiction in that setting. A Home for Christmas is her first published story. Dakota's Promise, a romantic suspense novel set in 1939, and two novels in her Belden homesteading trilogy, Song of Dakota and Day by Day, are currently being considered. A blog with history of the area is on her website, kristiekandoll.com. Reading the inspiration behind my co-authors stories is interesting and a lot of fun. Keep the blogs coming, Heather. Writing the Scriptures - 3 Wonderful Discoveries!